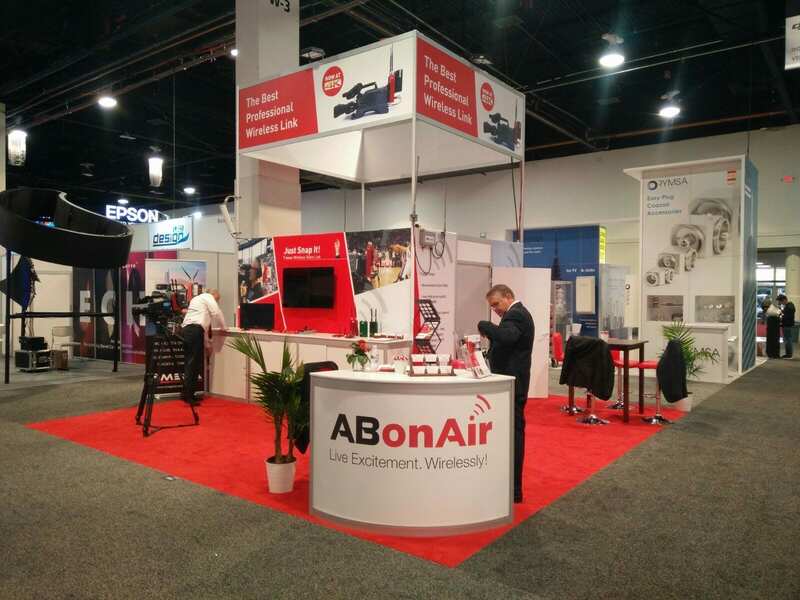 Las Vegas, April 10, 2018 – ABonAir, a leading provider of wireless broadcast solutions, will be unveiling the world’s first 4K 7 msec delay wireless broadcast system at NAB Show 2018. This new ABonAir system answers the need for live broadcasters who work in a challenging, fast moving and unpredictable environment. The action moves from one place to another at the speed of light. Sports broadcasters move live feeds from one end of the stadium to another, from the locker room to the tunnels to the field and through the audience stands. Live news broadcasters follow the story and don’t have the luxury of a predefined zone of operation. Live events have huge screens that audiences rely on to keep up with the show. The new AB612™ system enables camera teams to wirelessly transmit 4K video with a remarkable 7 msec video delay directly from cameras to media centers or OB trucks. Built on ABonAir’s bi-directional radio channel between transmitter and receiver, the AB612™ acknowledges every packet of pixels in 4K and HD. It is the perfect choice for signature sports and live events. One of the core elements of the new AB612™ system is ABonAir’s Fiber Coverage Extender (FCE), which enables real time multi-zone coverage of any zone of the venue (e.g. football and soccer – playing field, locker room, tunnel and audience) or simultaneously on completely separate sites (e.g. football stadium, basketball arena and swimming pool) all via fiber cables with unlimited range. For real-time multi-zone coverage, the ABonAir system requires just one FCE at each venue and only one Receiver at the control room. The FCE supports an unlimited number of antennas and ensures unlimited coverage. Eran Igler, ABonAir CEO: “Our team of experts has designed a revolutionary solution that will take the entire wireless broadcast microwave industry to a new era. With our NEW system, the AB612™ sets a new industry record and offers professional broadcasters new opportunities that will revolutionize live event coverage. We are excited to reveal this new system at NAB 2018″. ABonAir is the leader in wireless broadcast solutions for live sports, news and live events. Our 5th generation wireless broadcast solutions broke the lip sync barrier with an industry first 7 msec sub frame delay. At NAB Show 2018, we are unveiling our 6th generation product which adds full 4K support while maintaining all technical features. ABonAir created a new product category – the Fiber Coverage Extender – which is tailor made for American universities. The FCE enables multi venue coverage at 7 msec delay, avoiding the need for multiple receivers and other expensive equipment.